How good are you in FEA? Take a test to find out! This is not meant as one of those horrible school tests. It will take you around 2-3 minutes. Test your FEA skills! How much do you know about FEA? I've prepared a few questions for you! If you are quick it will take you around 2-3 minutes. This is a simple piece of L-section. One end is fixed, while the other is loaded as you can see below. What is the correct von Mises stress distribution? You have this nice compressed element. Can you use symmetry through the middle in the analysis? YES! Symmetrical geometry + symmetrical loads = symmetry is ok! NO! I can't use symmetry in the place where a support is! NO! This might buckle, and such symmetry would cause buckling analysis to show wrong outcomes! You are testing a cylinder in a hydraulic press. If it is uniformly supported at the bottom (as below) it doesn't matter if you use load or enforced deformations in your linear FEA model - the stress distribution will be correct. What if the cylinder would be supported on 4 small supports instead of entire circumference? It's the same! Both uniform load and uniform enforced deformation will produce the same outcome. When it is reasonable to model a bolt as a beam connected with RBE2 elements to the circumference of the opening in a plate assuming you are interested in stress distribution in the pleat near the bolt? This is never a good idea! You used 3 mesh sizes A, B and C and you read stress for each of them. You want to have an outcome within 10 MPa accuracy. Which mesh size should you use? None - the stress is not converging! This is a stress singularity! None - there is not enough data available! You analyzed the same problem with more element sizes. Which mesh size shuld you choose for 10 MPa accuracy? None - there is not enough data aviable! Which mesh produce more accurate outcomes in complex cases: QUAD8 elements or 4xQUAD4 elements instead of each QUAD8 element? QUAD8 element is better - it's nonlinear! 4x QUAD4 elements are better - they have more nodes! They are almost the same! It depends on whether you want to calculate stress or strains in the model! 9. What kind of support is that? This rectangle simply stands on the ground (it is not attached). You can see the loads below. What boundary conditions would you apply at the bottom edge? Want to know the right answers? 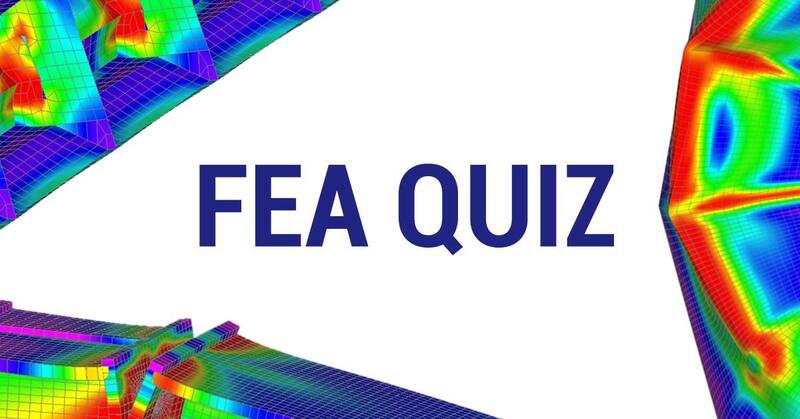 Challenge your friends - share this FEA Test!